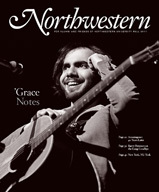 The fall issue of Northwestern’s alumni magazine contains an excellent cover story about Amazingrace, the Evanston non-alcoholic coffeehouse and nightclub that began in the basement of Northwestern’s Scott Hall in 1971. After moving to Shanley Hall in the spring of 1972, the group enjoyed a reputation beyond Evanston and Northwestern for hosting folk singers. By 1973 the twelve original members of Amazingrace had either graduated from Northwestern or dropped out and began living communally in a house in Evaston at the corner of Sherman and Colfax. In 1974, after years of zoning disagreements with Northwestern and the city, Amazingrace severed ties with Northwestern and moved the The Main, a newly built “town center” shopping area at Main and Chicago. According to Northwestern University Archives, during the next few years Amazingrace continued to gain in popularity and became one of the best places in the Chicagoland area to hear live music. Times were changing, however, and refusing to embrace the changing business culture of the late seventies was the group’s downfall. Amazingrace fell behind on their rent and were evicted in July 1978. For more information on Amazingrace coffee shop and nightclub checkout the library’s reference files, Northwestern Library Archives, or read the Northwestern feature article where you will also see wonderful photos of an interesting piece of Evanston’s history.